Not in the ozone layer, but in your pocket. It retails for a whopping $7,500, which could get you a decent second hand family sized sedan that is still running just fine. Well, if you feel that your pockets need a little lightening up while aiming to get some exercise in the process, the Pi electric bike sounds like a pretty good idea. The Pi comes with an aluminum monocoque frame that is constructed from a single piece of made-up metal that shares a similar thickness all over. In terms of electronics, the batteries are of the nickel metal hydride variety and not lithium ion which we have all come to know and love in our fair share of gadgets and gizmos these days. As for the motor, it is a 36-volt brushless DC model that cranks out around 1 horsepower, or 750 watts. Needless to say the final output depends on just how much human power you put in, but I seriously doubt you’ll reach double digits in terms of horses since you’re, well, only human. The Pi electric bike is currently available from Design Within Reach (although a company name like Price within Rich would surely elicit a laugh or two) and has a maximum speed that registers less than 30 miles per hour. Of course, the bike does hold more power underneath its, er, hood to go faster than that, but you’ll need to get a motorcycle license for that. Each purchase also comes with a designer helmet so you and the Pi will look like one complete entity whenever you take it out for a spin. The NuVinci planetary gearbox is unique as it changes gear ratios without actually manually switching gears, making it much easier to navigate steeper terrains. Throw in another $1,800 and you’ll be rewarded with a solar charger that further reduces your carbon footprint. Looks very impracticle, unfortunately. 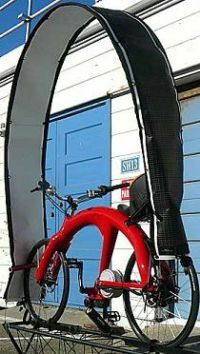 check out izipusa.com for some real ebikes that are not only affordable but not part of the freak-show.